The MUC Ballroom was filled with food, dancing, singing and laughter on Sunday night. 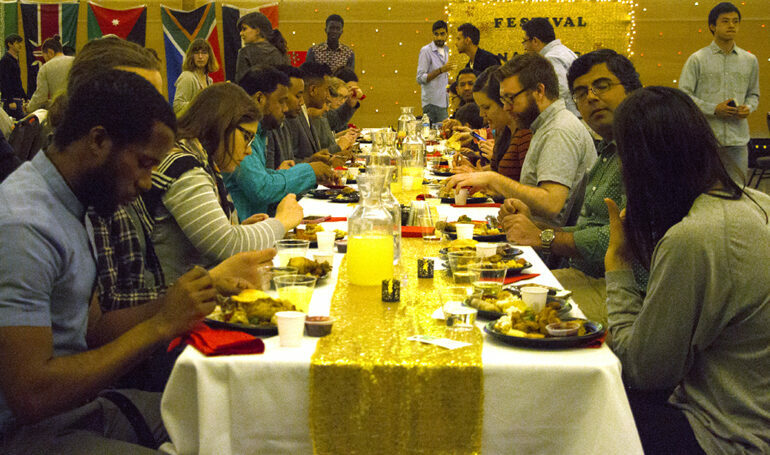 The International Club hosted their annual Festival of Nations event that brought students, faculty and community members together with the purpose of celebrating culture from all over the world. In years past, the event has had an average turnout of 200 participants. This year, Brandi German, International Club president, said she had a personal goal to make the event larger than in years past, and she accomplished her goal with around 350 guests in attendance enjoying the various food and culture. German said the event is “basically a really big buffet,” and featured dishes from over 30 countries this year. “We ask students to cook dishes from their countries, or if they are domestic students they can cook something from their home or another country if they want,” she said. Besides the food, guests were also able to watch traditional dance, listen to traditional songs and poetry readings. Zoufishan Ahmer, a junior marketing major and Pakistani international student, performed three traditional Pakistani songs. Ahmer said she hoped audience members were able to understand her songs even with the language barrier. Ahmer is attending USD on a student exchange program, and she’s the cultural ambassador for her home country of Pakistan. She said she chose to perform at the Festival of Nations event this year because she wanted to use her talent to represent her country. Rabab Alkhalas, a sophomore psychology major, volunteered to help decorate for the Festival of Nations event. The ballroom was lined with flags of the countries that were recognized at the event. Alkhalas said she thinks it’s important for non-international students to attend events like the Festival of Nations. German said normally international students help put on the event because there’s a larger number of international students in the International Club. Students do not need to be an international student to become a member of the International Club or attend events put on by the group. Alkhalas said the Festival of Nations is a great opportunity for non-international students and international students alike to learn about different world cultures, something she thinks is greatly important. Video by Kassidie Cornell for Coyote News.